A night light offers both safety and security. Use one on the kitchen counter, a windowsill and several on the floor, to light the way at night. Simple silhouette shapes are easy to make and to paint. 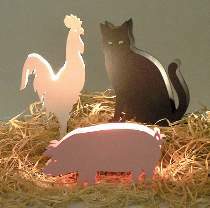 Plan includes a Country Rooster, a Cat and a Pig. All patterns drawn full size. Order one Snap in Candelabra Socket with Clear Bulb for each figure.